I get very irritated at gardening books and experts which tell Aussie gardeners that peas and beans will fix nitrogen in their garden soil. The theory being that the nodules on legume roots hold nitrogen, and when the roots die off, the nitrogen is returned to the soil for other crops. Some crop rotation patterns and recommendations for fertilising legumes are based on this myth. 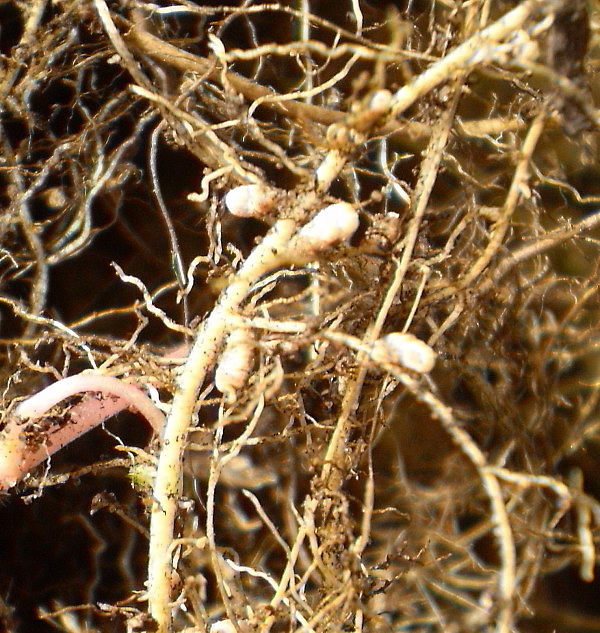 Legumes roots require the presence of suitable bacteria in soil to efficiently fix nitrogen in the nodules on their roots. 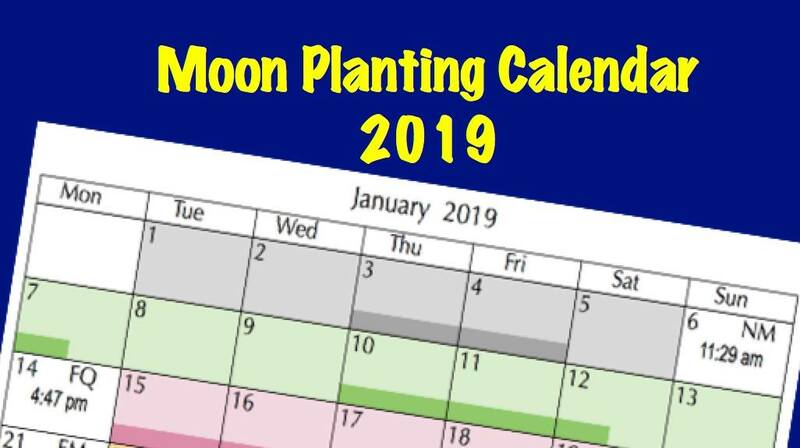 The legume vegetables and flowers we grow originated in the Northern Hemisphere where nitrogen-fixing Rhizobia bacteria occur in soils, but they are not naturally found in Aussie soils; they must be introduced by sowing seed that has been inoculated with a suitable rhizobium. Some groups of rhizobia are effective for several legumes; others are specific to a particular crop. Some crops, such as French beans, require a specific rhizobium that is very difficult to find here, and these will not be able to fix nitrogen effectively. You can verify nitrogen fixation yourself by gently digging down beside a legume plant to expose some of the roots with nodules. 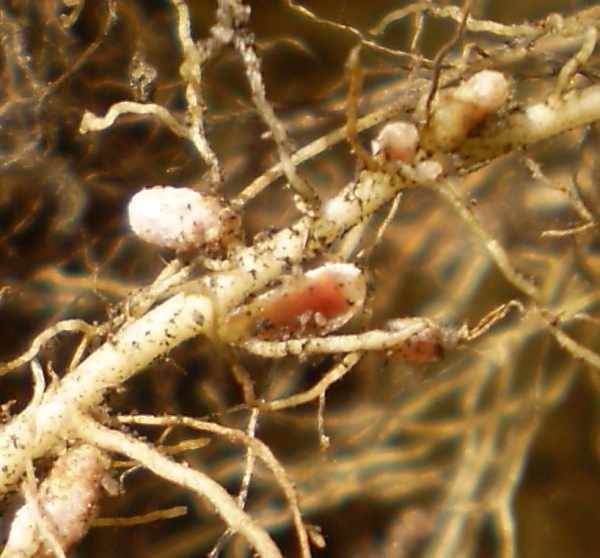 The nitrogen-fixing nodules can be clearly seen on the White Clover roots in the photo below. When sowing uninoculated legume seed, you will have to include enough nitrogen in the fertiliser for good growth, and avoid lower leaves of legumes becoming yellow. This occurs when the plant contains insufficient nitrogen or magnesium and the plant draws these elements from the lower leaves to the young tips in an effort to keep growing. This entry was posted in Fruits and Vegetables, Healthy soil and tagged Aussie gardening, Australian gardening, easy gardening, easy organic gardening, environmentally friendly gardening, fertilisers, fixing nitrogen, flowers, fruit, garden soil, growing plants, Healthy soil, Herbs, how to grow, legumes, Moon Planting diary, nitrogen, nitrogen fixation, organic gardening, plants, propagating, sustainable gardening, vegetables. Bookmark the permalink. Thanks for those tips on how to determine if plants require extra nitrogen or not. If I see yellowing leaves in future, I’ll test the nodules for the indicators you suggest.